For the first time, Fighting Insider will feature a sports icon who made a big contribution to Mixed Martial Arts. Presenting the father of Brazilian Jiu Jitsu -- Helio Gracie. Born on October 1, 1913, Helio Gracie is a Brazilian Jiu Jitsu fighter who founded the Gracie Jiu Jitsu or Brazilian Jiu Jitsu with his brother — Carlos Gracie. He is widely considered as one of Brazil’s sports heroes, and known to held the 6th dan rank in Judo. During his early years, the Judo was commonly referred as Kano Jiu Jitsu or just Jiu Jitsu. Due to Helio Gracie’s smaller size, the Jiu Jitsu moves was much harder to execute as it requires brute strength. Hence, he adapted the techniques for his particular physical attributes. As a result, Gracie Jiu Jitsu was invented. Later on, Gracie Jiu Jitsu became internationally known as Brazilian Jiu Jitsu. The Brazilian Jiu Jitsu uses techniques that enable smaller and weaker practitioners to defeat larger opponents. 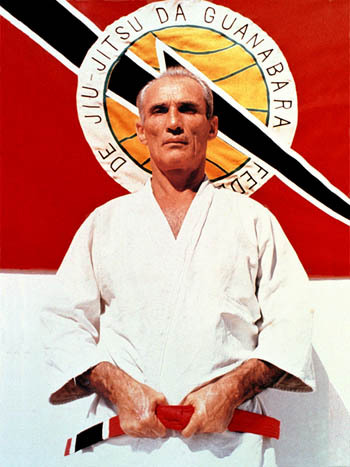 The father of Brazilian Jiu Jitsu, Helio Gracie died on January 29, 2009 at 95. 1935: Submitted Dudu by Side Kick to the spleen.